As the October 11th strike approached, Chicago teachers set up a strike headquarters and distributed picket signs while parents and their children picketed the mayor’s house. After 18 months of bargaining, and over a year since their contract expired, the Board of Education blinked just before the deadline and came up with a significantly better contract offer that is now being debated within the Chicago Teachers Union (CTU). Both the earlier January 2016 Board of Education proposal and the changes contained in the new tentative agreement are available online. In the context of the attacks on public education in Illinois and across the country, the four-year tentative contract pushes back the latest attempts to force teachers and support staff to pay for the crisis in funding public education, making modest gains in improving the conditions of teachers and neighborhood schools. On October 19 the House of Delegates voted 328-153 to approve the agreement and submit it to the membership for a vote. Still, many questions remain as to whether gains made in the contract can be felt in the everyday work lives of CTU members. Will there be sufficient funding available to fund the agreement, should it be approved? The tentative contract is a testament to the continued strength of the CTU. Without a strike looming, the Board would not have blinked. The union has pushed back on the mayor’s consistent demands that teachers help pay for the deficit in the Chicago Public Schools (CPS). It is estimated to be as large as one billion dollars. In spite of the anti-union and anti-public worker pension demands by CPS and the new anti-union governor, Bruce Rauner, parent and community support for the CTU remains strong. 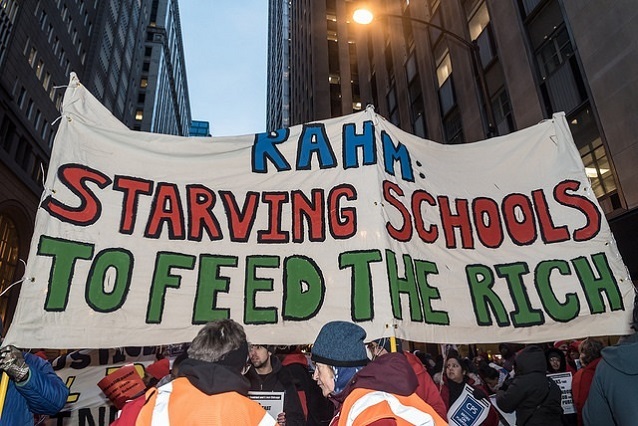 Neither the city of Chicago nor the state of Illinois are broke, but they are attempting to balance their budget by forcing concessions on the teachers or even possibly pushing the system into bankruptcy, where a financial oversight agency could impose an austerity contract. For its part, the CTU has been consistent in bringing the issue of funding to the forefront by highlighting tax-diverting schemes like the Tax Increment Financing (TIFs), which siphon property taxes intended for blighted areas into accounts controlled by the mayor. These are then often used to fund corporate developments instead of schools and other social services. TIF money has been used to finance a basketball arena for DePaul University, build a Marriott hotel, help the Pritzker family construct a tony hotel in well-to-do Hyde Park, subsidize United Airlines and build a luxury car dealership on the north side. Unfortunately, these egregious instances of using tax money to help the rich remain a divisive point among various segments of Chicago labor. The building trades are in favor of these construction projects, despite the harm they do. The proposed agreement uses a significantly larger amount of “excess” TIF funds to plug the budget hole, but that still is only a stopgap measure. It doesn’t address the overall inequitable funding system that relies predominantly on property tax revenue to fund schools (meaning that poorer communities have a lower funding base than wealthier communities). Yet in a sign of CTU’s political influence and the weakening power of Mayor Rahm Emanuel, 40 out of 50 aldermen signed on to a proposal to distribute the surplus directly to the schools. For his part, the mayor believed he could demonize teachers and declare their decision to strike a “matter of choice” when they have been without a contract, were understaffed, faced severe cuts to programs, and then threatened with a pay cut. The Board policy of drawing out the negotiations prevented a timely strike during the last school year, but the CTU showed its muscle by calling a one-day strike April 1st. As a result of that mobilization, teachers won significant new support from the Black Lives Matter movement as well as from union locals, including the Amalgamated Transit Union and university professors who work at various campuses, all suffering from severe cuts. Chicago has the only unelected school board in the state of Illinois; members are directly appointed by the mayor. Between 1995 and 2005 the city council, under the leadership of Richard M. Daley, propped up the budget through a magic trick, diverting two billion dollars’ worth of pension payments into the school system’s operating budget. Since the 2012 strike, the Board of Edu­cation has refused to go after new revenue to fully fund both the Chicago Teachers Pension Fund and eliminate the budget deficit. The demand by the Board, appointed by Mayor Emanuel, to make the teachers pick up 7% of the 9% of their salary that must be paid into the pension system, rubbed salt in the wounds of classroom teachers who have been forced to deal with school closing, layoffs, decreases in school funding and generally deteriorating working conditions. Last year, however, the state Supreme Court ruled that the city cannot walk away from its pension obligations. Although fully funded as late as 1993, pension funds have dropped to a 58% funding level. Over the last three years the Rahm Emanuel administration has pushed for the state to pick up the pension payments. However, under the leadership of Governor Rauner, the state legislature seems unlikely to pick up the tab. In fact the flat state income tax was reduced from 5% to 3.5%, fueling a self-inflicted funding crisis. Legislators are also unwilling to eliminate corporate tax loopholes or in any way ruffle the feather of their corporate donors. Currently the state lacks a budget, with both the Democrats and Republicans waiting for the November elections to judge whether the balance of power shifts. (The Democrats have super majorities in both the House and Senate, but lack the unity to overturn vetoes by the governor.) The situation is so dire at Chicago State, a university that has historically educated many African-American teachers, that this year its incoming freshmen class is only 87 students. It was forced to truncate its spring semester to save money; the school’s very existence is threatened. For the past two years CPS has operated under a new funding system called “student-based budgeting.” Schools are allocated a pot of money based upon student enrollment. When faced with hiring decisions, school principals are pushed to hire the least experienced teachers who are lower on the salary scale. This means that when veteran teachers are laid off, they are often forced out of the profession since principals refuse to hire a more experienced and higher-paid teacher. Experienced Black educators have been disproportionately impacted — and pushed out of teaching. A second pressure on public school teachers and staff results from limitations on seniority. Teachers with seniority have no right to transfer to another school so when positions or jobs are closed, their careers are in jeopardy. In 2012, when CPS shut 53 schools, African-American teachers were 52% of those terminated while their overall percentage in CPS was only 27%. A decade ago 31.4% of the teachers were Black; today it is only 22.6%. Meanwhile, of the new hires only 13% are African American. Over the course of a decade this disproportion means that in a school system where 39% of the students are Black, fewer and fewer of their teachers are. Another case in point is Roosevelt High School teacher Tim Meegan, a 12-year veteran teacher. He was one of five CTU members who ran for positions on the city council during the last election, almost causing a political insider into a runoff election. Losing his job in the August layoffs, Meegan was forced to take a position in Mankato, Minnesota. The possibility of finding another job in Chicago, given his years of experience and political activism, was bleak. There is a debate within the CTU over whether there is a real funding crisis in Chicago. Over the years CPS has cried that it is broke only to be able to balance its budget later, so some activists believe the city is crying wolf again. In that case, a strike could force CPS to open its coffers and solve the problem. But that does not seem realistic given the current revenue stream. The question had been posed: What can be gained from a strike? In the wake of the tentative agreement there have been loud objections to its terms, with one former activist calling it the “worst contract in CTU history.” Arguments range from the size of the wage increase to desires to more effectively protect class size, to oppose excessive paperwork and for better working conditions for special education personnel. Opponents also charge there was insufficient will to carry out a strike. There is no doubt that no matter what agreement is reached, the ability to enforce and pay for it, regardless of what’s in the contract, depends on the ability of the union and its members to exercise power within the schools and politically at the city and statewide levels. Let’s look at what is in the contract and what it promises. One of the main issues was the desire of CPS to cut costs by forcing teachers to pick up the entire cost of their pension, meaning a big wage cut. Because Illinois teachers are not part of the social security system, they must rely on their pension for retirement. Currently 499 out of 769 school districts in Illinois pay part or the entire employee pension contribution. In the January tentative agreement, the Board payments would have been phased out and teachers would have received pay raises and health care increases resulting in a net pay cut. In the new tentative agreement all current employees will continue to have the Board pick up the 7% pension cost while employees hired after January 1, 2017 will have the pickup phased out in two steps as increases to their base pay will offset that amount. Over time, as people retire, all employees will pay for their pensions, but based on a higher base salary. While there will only be a 2% and 2.5% increase in wages during the last two years of the contract, the step-and-lane system of compensation, which “education reformers” wanted to eliminate — and was suspended in the 2012 contract — will be retained. A .08% raise in the cost of health insurance does reduce the effect of the modest raises. Merit pay, another Board desire, was, just as in the last contract, dead on arrival. The agreement provides for a 10-month paid period where there is a reassignment pool for laid-off teachers and paraprofessionals. This reestablishes what had been lost in the last contract, but with even stronger recall rights and layoff protection. The agreement restores a small amount of teacher preparation time for elementary school teachers. Although the evaluation system is still flawed, the union won additional rights to grieve unsatisfactory evaluations and put an end to having teachers tested outside their subject areas. As layoffs are determined on the basis of a teacher’s rating, this is an area of extreme importance, especially because abusive principals have an incentive to give lower ratings to experienced teachers. The issue on which the union has built its public support has been the demand that Chicago’s children deserve quality schools. Class size limits, a curriculum that goes beyond test prep, wraparound services, counselors, librarians, and quality neighborhood schools are crucial to the vision that the CTU championed. Many activists felt that it was essential that community issues be addressed in the contract — that these issues were as important as defending the pay and working conditions of teachers and support staff. So how did that play out in the tentative agreement? Modest gains were made in several areas. One egregious CPS practice has been outrageously high classroom sizes with as many as 37 students in kindergarten or early elementary grades. In the tentative agreement, when class sizes are over 31 in K-2 classes a teachers’ aide is to be provided. While that will probably make life more tolerable in those too crowded classes, it will also tend to put a cap on what is still way too large a number. Most educational research points to a strong link between small classes in early elementary grades and lasting impact on student growth. This is an area that needs to be improved in the future. It is of course very expensive. Another gain is to mandate that the Board obtain a minimum of $500,000 funding for between 20 and 55 community schools. These would be models of what all the schools should be. They would have wraparound services including medical and mental health services, after-school programs and restorative justice in place of punitive discipline. While establishing lofty goals, the funding to make them successful is not guaranteed, but needs to be fought for. A clause in the tentative agreement also calls for no net growth of charter schools. Although it leaves the existing number of charter schools intact, at least it doesn’t deepen the hemorrhaging of funds going to new charters. A long-term solution remains the unionization of charters, bringing their contracts toward those of CPS teachers, and transforming them into fully accountable public schools. While the 2012 strike was a victory against an attempted imposition of austerity, nonetheless CPS was in a position to be able to increase the pressure on teachers. Layoffs, paperwork requirements, testing and evaluations have all made working in Chicago Public Schools more onerous. The question facing the union, both its leadership and its membership, is whether this agreement places the CTU in a position to continue to educate and mobilize its members and the public in the fight for a quality education. How could the modest gains written into the contract be enforceable and paid for? The new agreement depends on a large amount of future TIF money, which is not guaranteed. The CPS budget also counts on over $200 million in money from the state that is contingent on pension reform, and the chance that Governor Rauner would approve that is questionable. The reforms in the educational system that CTU calls for are just not possible without fundamental changes in funding that will require new taxes on the wealthy. Adequate staffing and wraparound services could easily cost hundreds of millions of dollars if extended to all schools. That is why just appropriating the $200 million TIF surplus to balance the budget this year is only a short-term fix. Governor Bruce Rauner’s threats to declare bankruptcy and take over the Chicago public school system are still real dangers. The community still supports the CTU and its members over the mayor. That support has remained high over the past four years, and the continued violence in Chicago and police murders of Black youth have deeply weakened the mayor. But while the mayor is weakened, so is the union due to job losses and school closings. 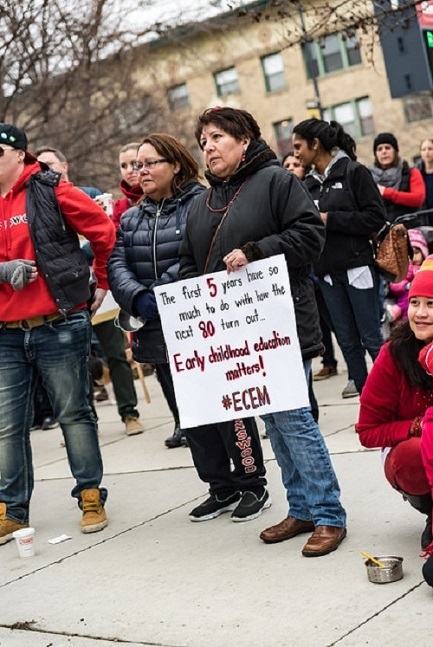 The question facing the CTU is not whether the membership will support a strike — they have decisively prepared for one — but whether any settlement can begin to address the endemic funding crisis. Without new revenue sources that tax the rich, schools will continue to be undermined and education and educators will suffer. While this same question is common across the country, who will pay is now sharply posed in Chicago. CTU has not shied away from calling out bankers and corporations that profit from siphoning money from public education and other public services. It is essential that activism — and engagement of parents and community members — continue and broaden. Judging by past experience, changes in the way education is funded, if moved forward in Chicago, can invigorate similar struggles in underfunded U.S. public school systems. Certainly the demands for progressive funding and increases in corporate taxes must be put at the center of teacher union contract negotiations. Rob Bartlett is a teacher in the Chicago area. This article will appear in the November-December issue of Against the Current.